Skin tissue starts to lose elasticity and volume as early as your mid-20s, even though the results of this process may not show for years. Before you’re a candidate for a surgical facelift, though, there may be places on your face that you’d like to tone up. Dr. Karim Khalil in Irwin, Pennsylvania, uses the GentleYAG® laser system from Candela® to address mild to moderate skin tightening needs. Call Irwin Laser Center in Irwin, Pennsylvania, or book an appointment online to learn how you can benefit. There are several approaches to skin rejuvenation, ranging from major ablative procedures that require extensive recovery to more modest procedures that let you return to daily activities immediately. The Irwin Laser Center often uses the GentleYAG laser system for the latter type of treatment. As its name suggests, the GentleYAG system works its magic without significant impact on you or your skin. The YAG laser penetrates the outer layer of your skin, targeting the support layers underneath. The light energy from the laser gets absorbed by the collagen, which heats slightly, about 10 degrees above body temperature, to what’s called the coagulation point. Once this tissue has warmed, the body senses that it’s been damaged. This triggers a natural rejuvenating process in which new collagen is made. The old tissue gets flushed away as new collagen takes its place. In places where you have lines and wrinkles, this new tissue fills in from underneath, propping up these passive lines and restoring some of volume that was missing prior to treatment. 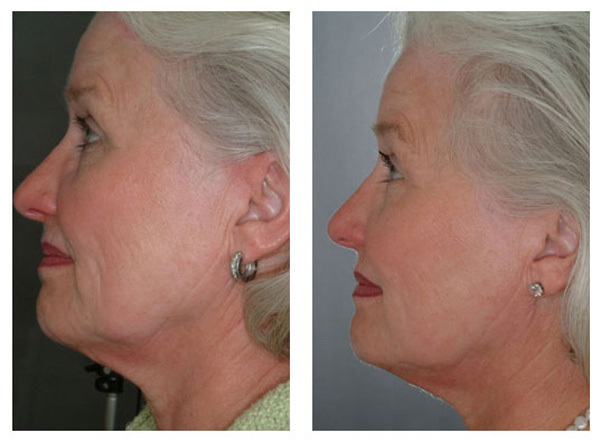 The result is smoother and tighter skin, with reduced appearance of lines, wrinkles, and other signs of aging. How does laser skin rejuvenation compare with other methods? Facial peels can accomplish many of the same goals as laser treatments. However, the chemicals used for facial peels can’t bypass the outer layers of your skin the way lasers can. When you have an aggressive chemical peel, your outer skin is literally burned off by the facial. Not only must the collagen layer renew, your body needs to regenerate the entire epidermis layer. Recovery time from a chemical peel may takes weeks to months, including a period where you’re unable to live your normal life as the healing process progresses. GentleYAG treatments, on the other hand, create minimal redness that typically passes in hours, if there’s any effect at all. Many patients successfully schedule treatments over their lunch breaks and return to work immediately after. What can I expect from a laser skin rejuvenation treatment? Treatments usually take about 30 minutes, depending on the area being treated and any other work you may be receiving. The sensation created by the laser is most often described as similar to the snap of an elastic band against your skin. Most people can tolerate the sensation without difficulty. The number of treatments necessary depends on your skin rejuvenation goals.